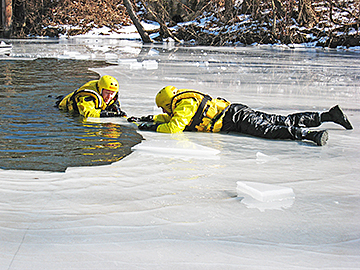 ICE DRILL: In spite of warmer temperatures, three to five inches of ice still covered the canal last Sunday when the Princeton First Aid & Rescue Squad carried out a drill involving ice rescue techniques. Dry suits and thermal protective equipment insulate Michael Kenwood (left) and Peter Simon, who recently became certified as surface ice rescue technicians, along with Bob Allen, Kathryn Bailey, David Feiner, James Ferry, Josh Franklin, Alex Gertner, Michael Kervan, Thomas Lowenthal, Nate Plough, and Matt Stiff. More information on the Squads emergency medical and technical rescue services can be found at www.pfars.org. Characterizing the case involving three Borough police officers as unusual and an anomaly in terms of what they usually see, Mercer County Prosecutor Joseph Bocchini and Deputy First Assistant Prosecutor Doris Galuchie met with Borough Council last Tuesday to explain how the case is progressing. Council also introduced an ordinance to charge a convenience fee for municipal transactions involving credit cards. While development on Princeton Ridge has been a subject of discussion since 2007, plans for the proposed age-restricted senior housing have seen some revisions over time. The Boroughs Historic Preservation Review Committee (HPRC) met last Wednesday to review the latest developments in the case of Speer Library, though a formal, final application has not yet been made. Planet Café, described by facilitator Ann Gazzard as a philosophical community café, is coming to Princeton. Beginning February 23, and following on the last Monday of each month, the group will meet at Camillos Café in the Princeton Shopping Center from 7:30 to 9 p.m.
Princeton Township Committee approved a supplement to its 2007 agreement with Rutgers Universitys New Jersey Sustainable State Institute (NJSSI) for the creation of a Strategic Sustainable Community Master Plan for the Princeton community. The $15,000 supplement is in addition to the original $20,000 appropriated for the project. Those funds, and the additional $15,000, are being made available through a grant from the Municipal Land Use Center at The College of New Jersey. It was the eighth swim in two days for each of them and the Princeton High boys team had been eliminated from title contention in the Mercer County Swimming Championships. Dealing with the difficult, often emotionally-charged issues presented in family law cases is challenging. Frequently settled in the adversarial atmosphere and setting of the court system, family law cases have also been addressed by a single mediator or arbitrator. Amber Spa, located at 16 South Main Street in Pennington, prides itself on keeping up-to-date with the latest techniques and products in order to offer clients the best service possible.